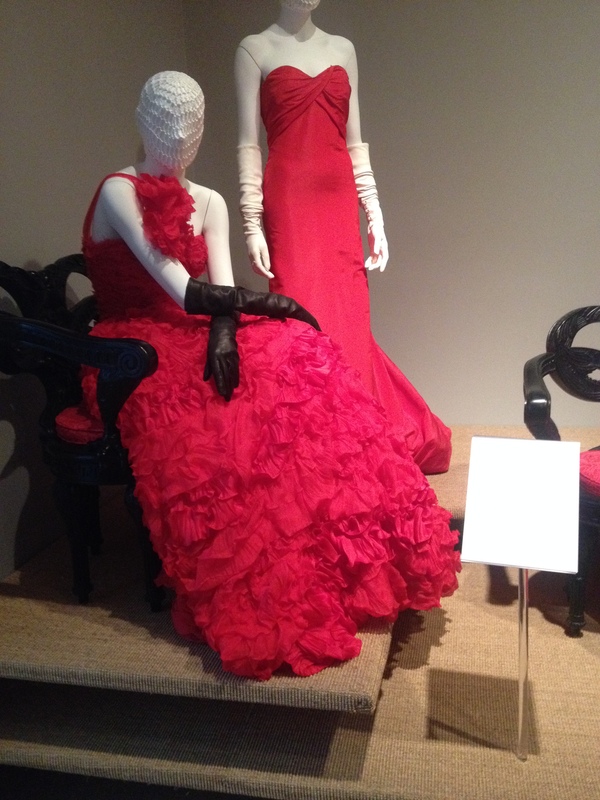 It was sad to hear of the passing of Oscar de la Renta last October. His designs were so feminine and flattering and his image was that of a kind hearted and true gentleman. No wonder we saw so many stars walk the red carpet in his gowns. 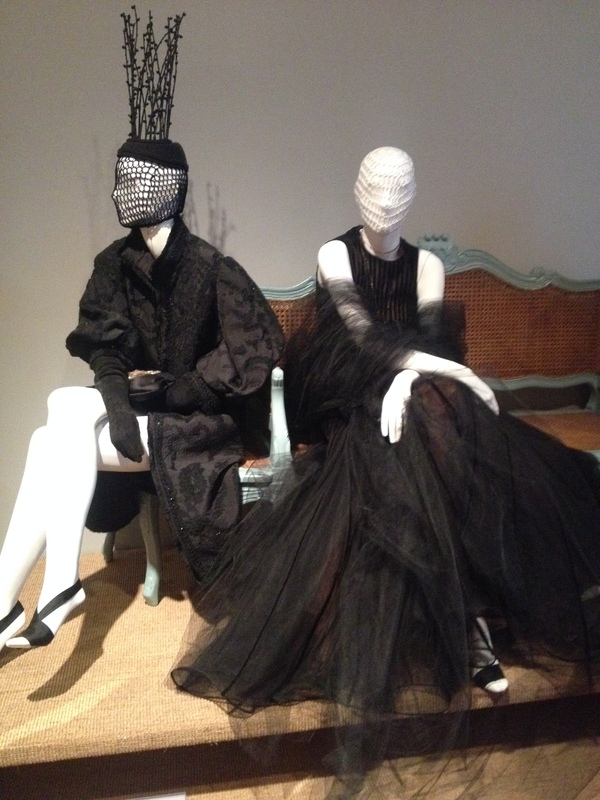 The exhibit, curated by Andre Leon Talley, will be on display at the Savannah College of Art & Design (SCAD) Art Museum until May 3. It is well worth a visit if you are in the area. I was vacationing at Hilton Head with my sister and we spent a lovely day in Savannah. 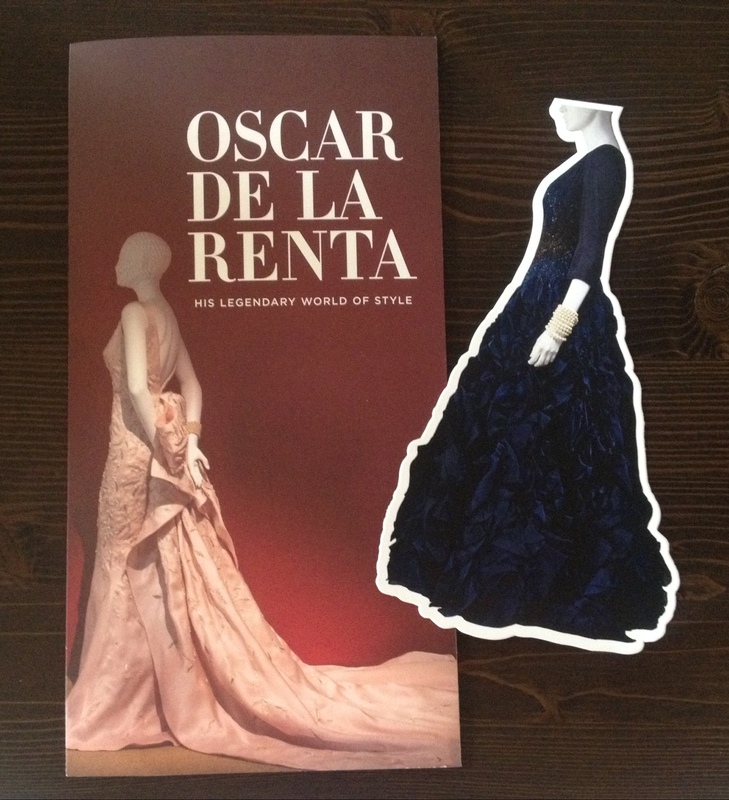 Don’t you love the ticket, it’s the navy dress Oprah wore to the Met Gala in 2010. 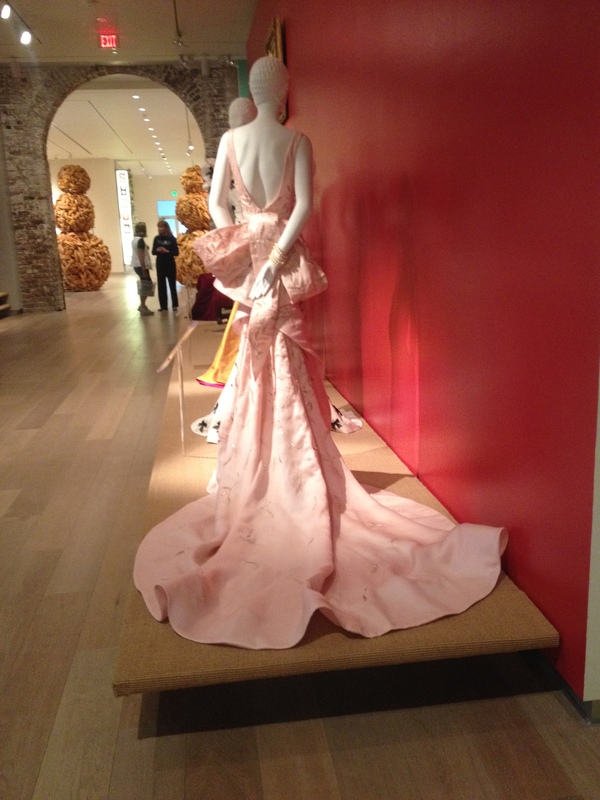 The guide has the pink dress Taylor Swift wore to the Met Gala in 2014. 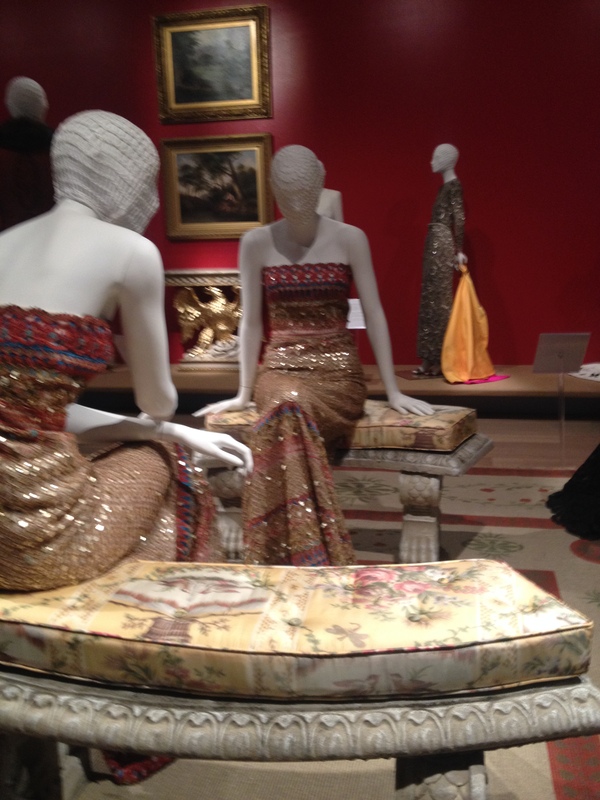 Many of the dresses were worn by famous women, or duplicates of the dresses worn and were on loan for the exhibit. 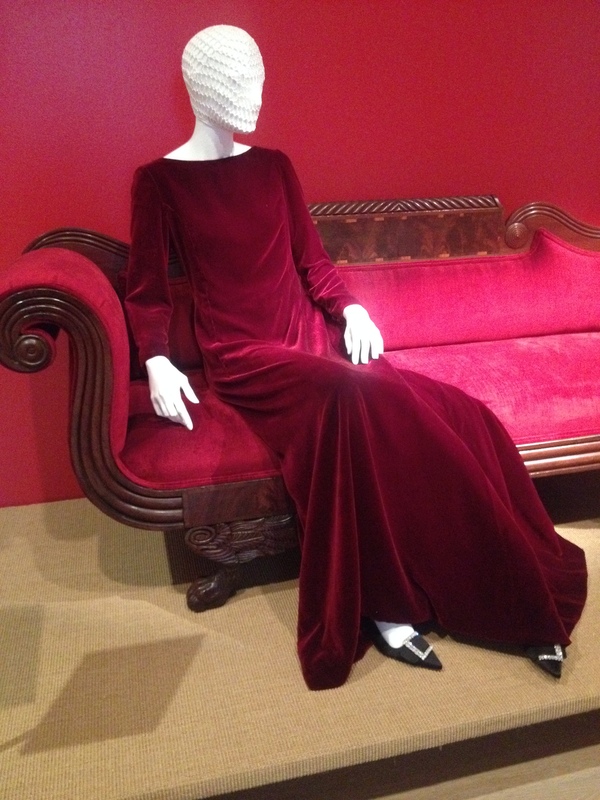 Remember this red silk velvet from the Vogue cover with Hillary Clinton in December 1998? 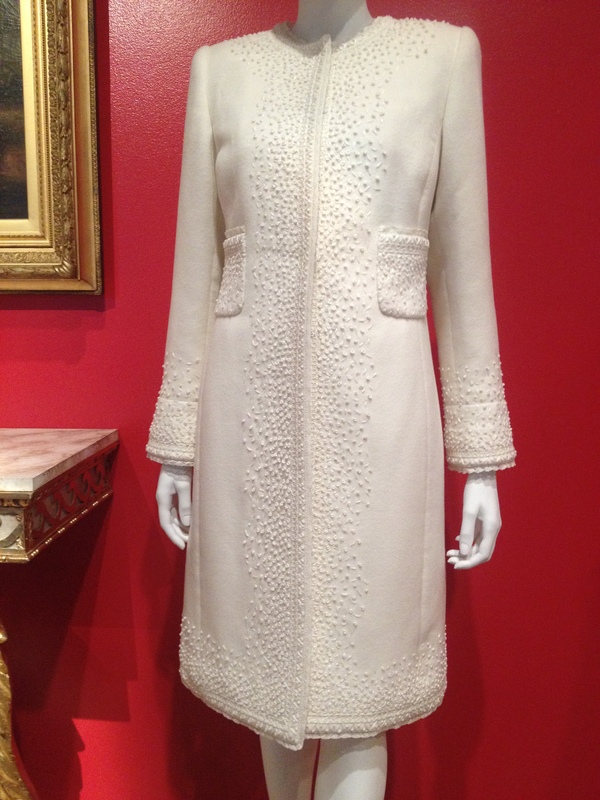 Another First Lady, Laura Bush, was also a fan of Oscar de la Renta and wore this embroidered coat to the inauguration in 2005. Such beautiful subtle detail. 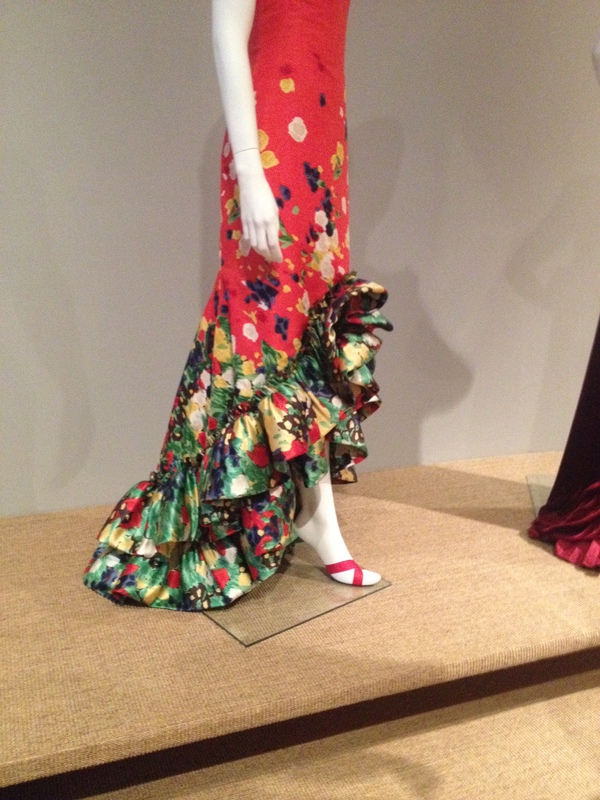 Many of the pieces were worn by Mrs. Annette de la Renta, such as this embroidered gown. Oh how I wished to see the inside of some of these works of art. 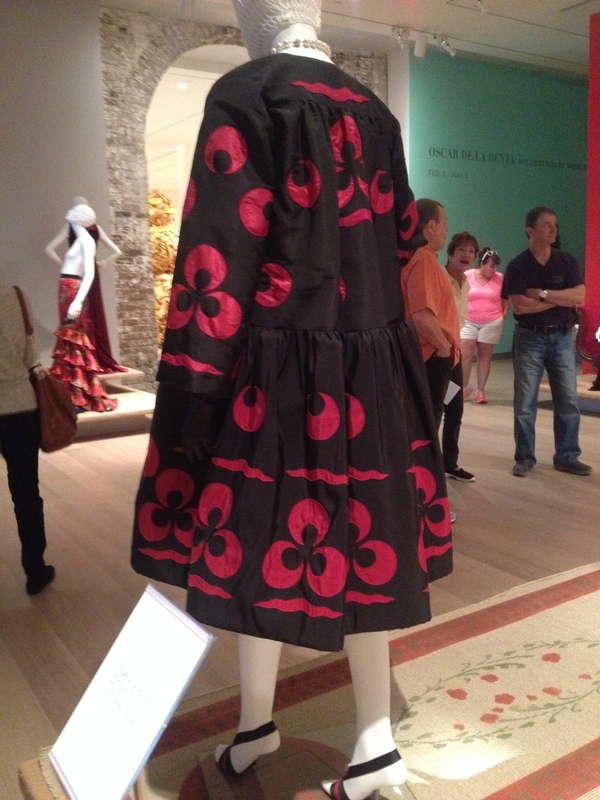 Although I wasn’t a fan of this dress, I was fascinated with the applique bows. 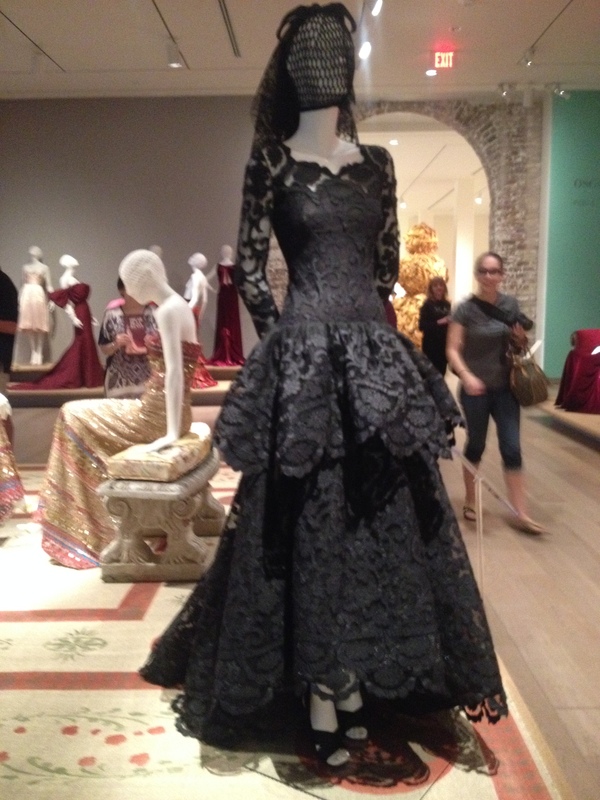 It was beautifully done and another Met Gala dress from 2012. 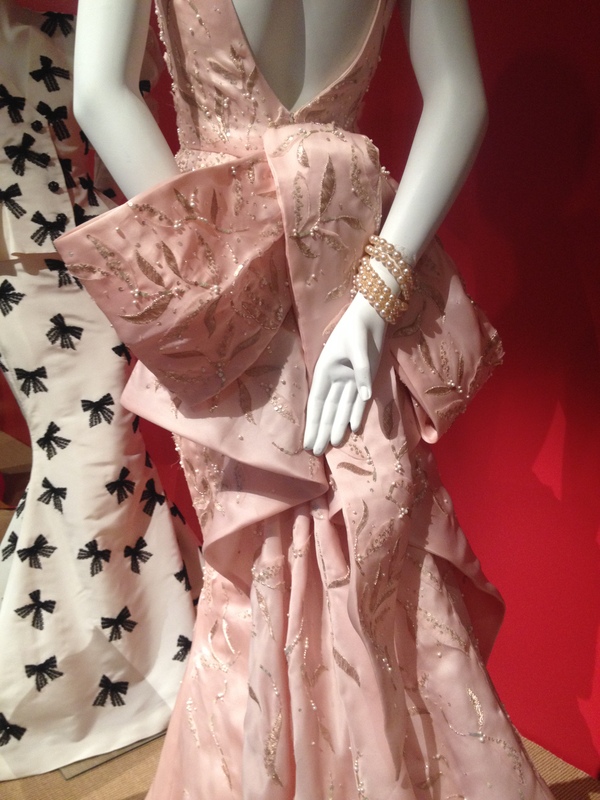 My favorite dress was the pink silk gown from the exhibit guide. I didn’t notice who had worn it until I started writing this post. I must have missed seeing pictures of Taylor Swift wearing it to the Met Gala in 2014. The detail was just beautiful. The individual leaves are stitched on, then embroidered and beaded. Gorgeous. 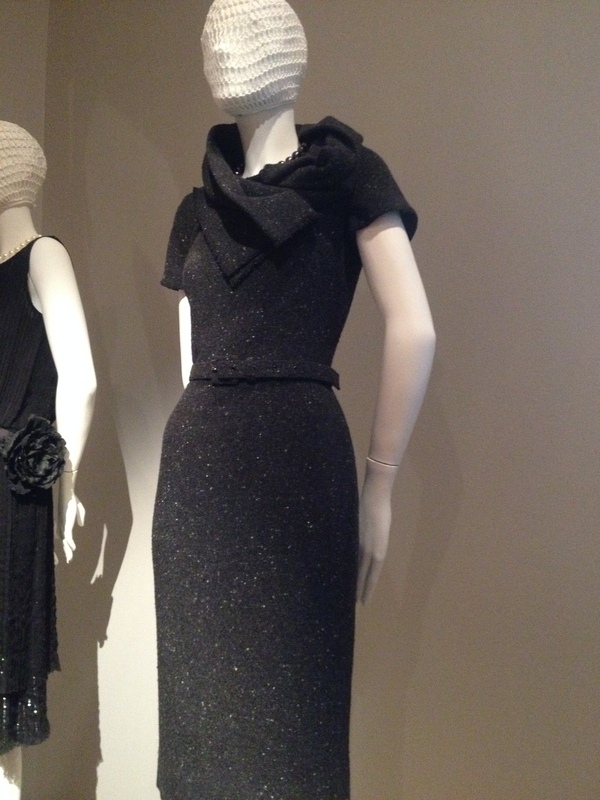 Even this cashmere and satin dress, worn by C.Z. Guest, was stunning with simplicity. 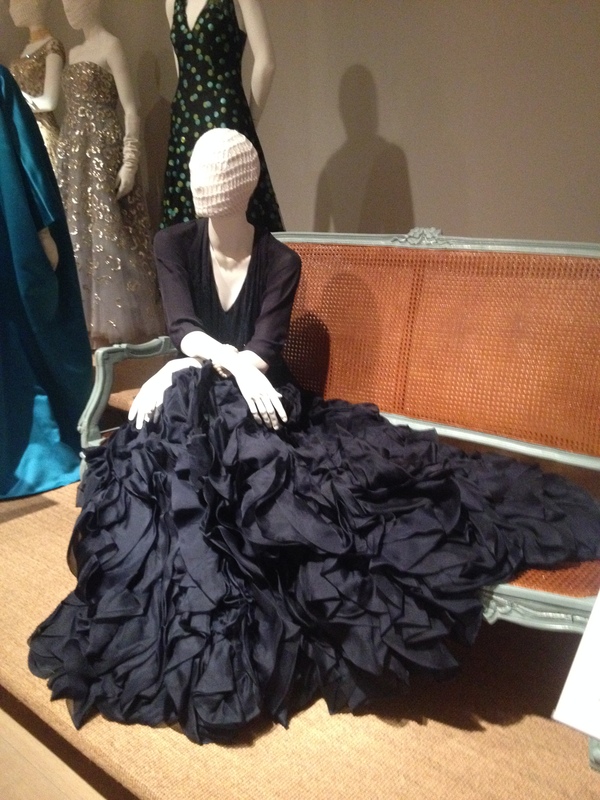 The dress was gifted to the SCAD Museum by her daughter, Cornelia Guest. Here’s a fun pair. The hat was done by a SCAD alum. 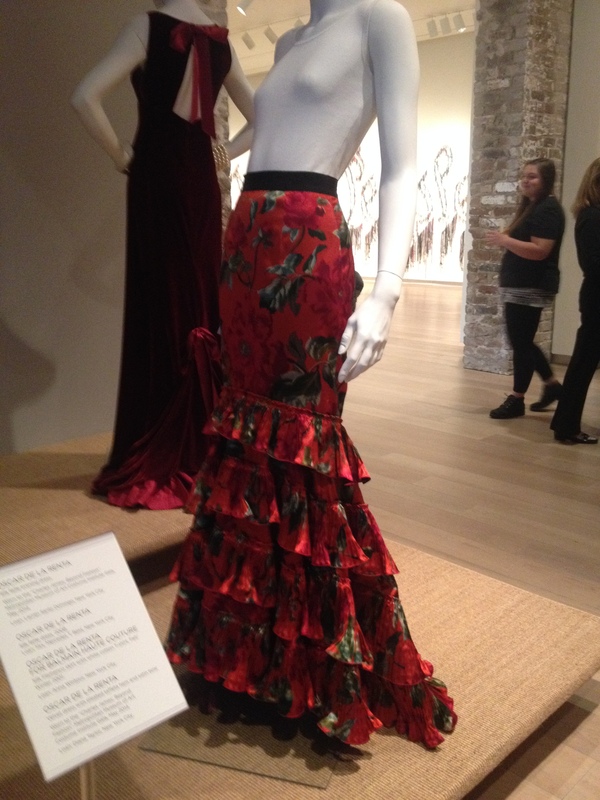 Remember this dress from the 2014 Met Gala, worn by Sarah Jessica Parker. I read it was her idea to add the signature on the back. 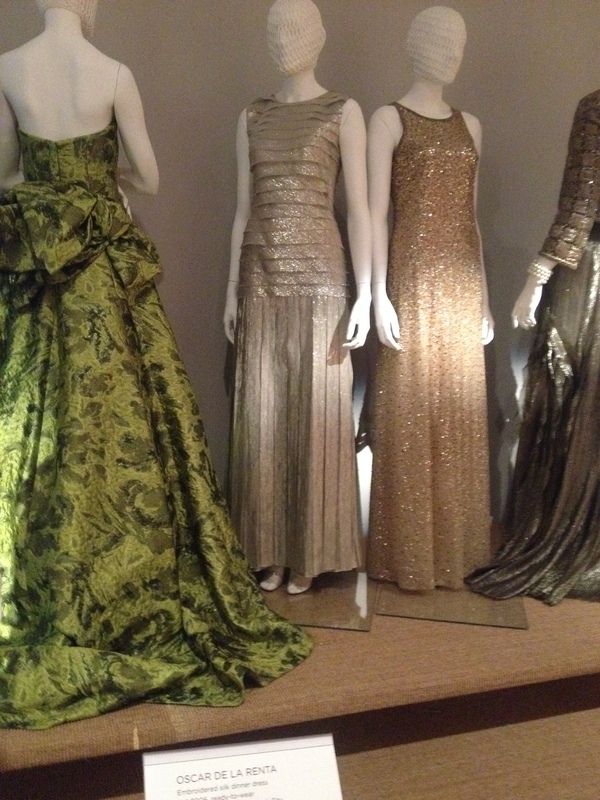 The green silk brocade gown was worn by Ivanka Trump and the gold lame by Anna Wintour. 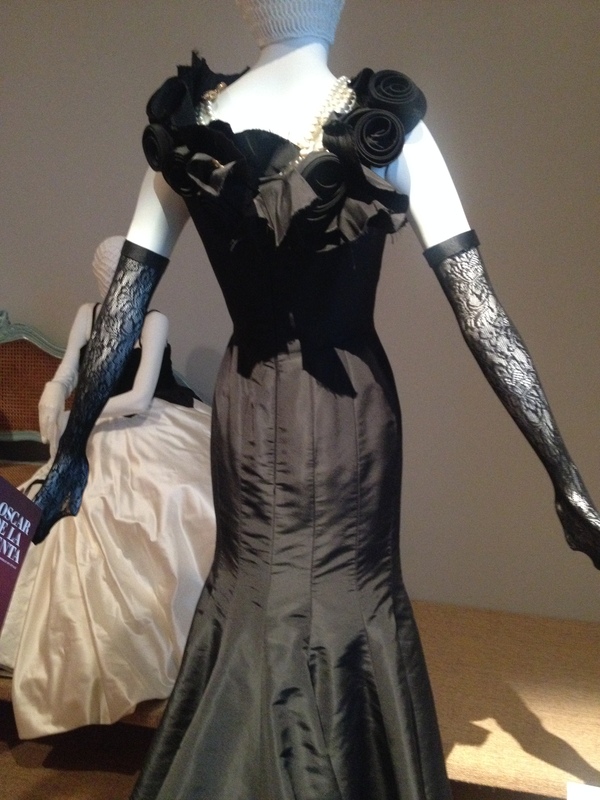 Texan Lynn Hyatt wore this silk Faille gown with the roses. 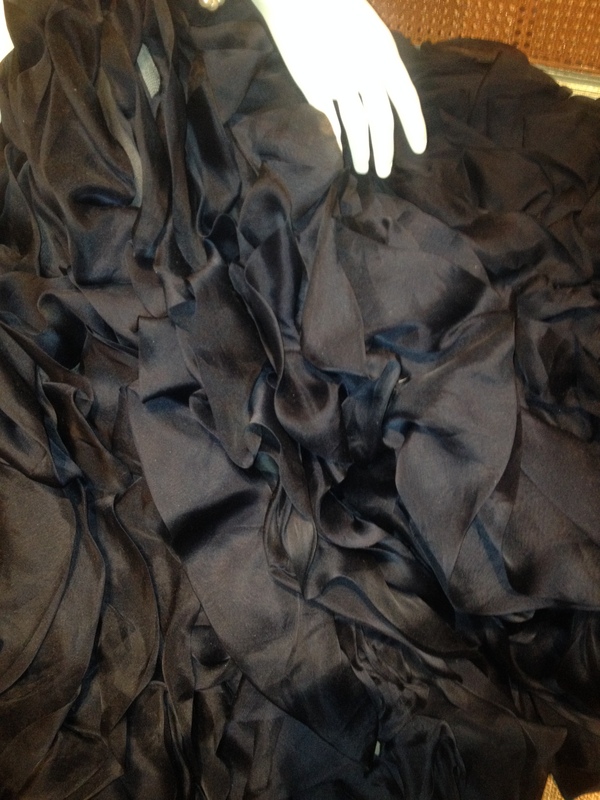 There looks to be some great structure to the dress, if only we could see the inside. 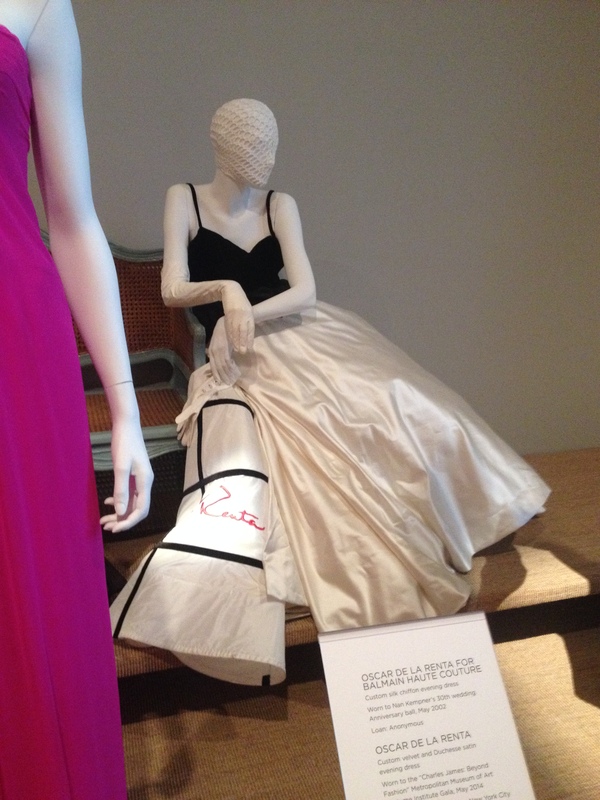 The “gloves” were really knee highs, gotta make do at a college museum. I love the collar on this tweed day dress. Hopefully I have correctly matched the dresses to the owners, I believe this sequined and embroidered dress was worn by Gail King. The manipulation of the fabric was amazing. 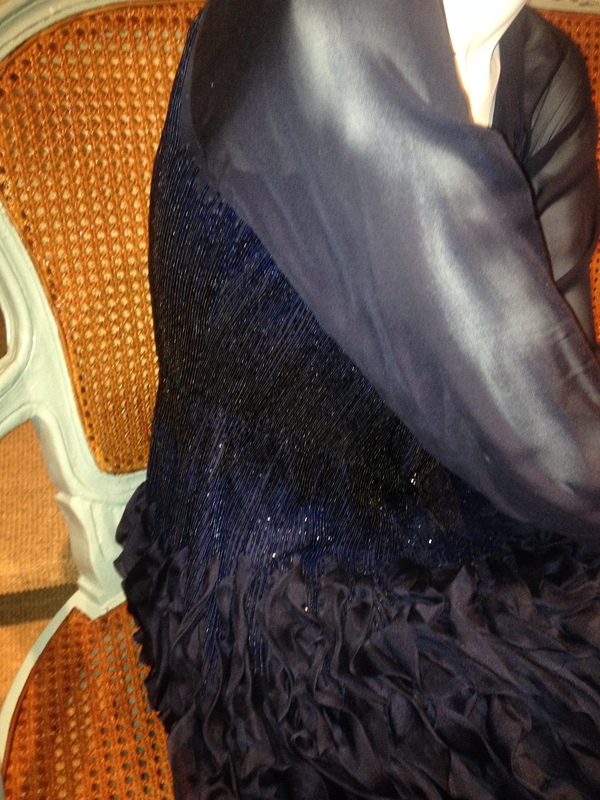 The navy silk dress on the event ticket belongs to Gail’s best friend Oprah. 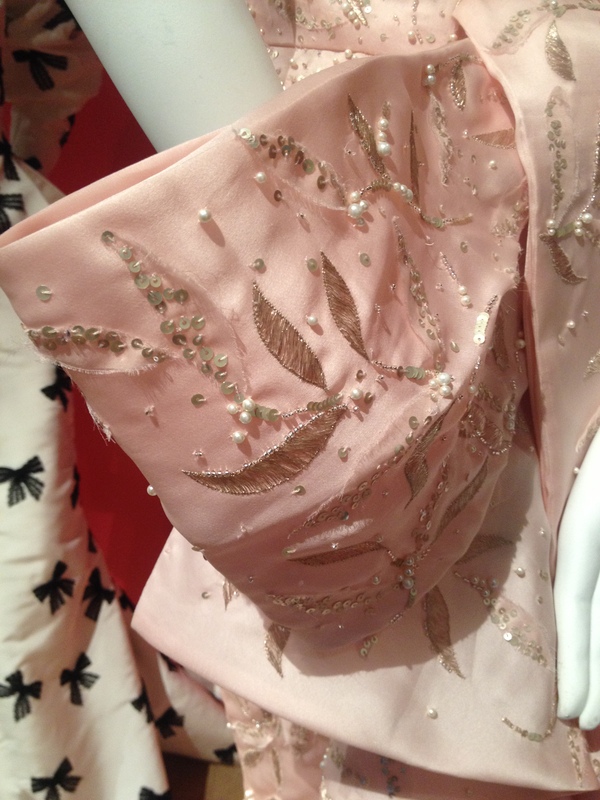 Another Met Gala dress, from 2010. 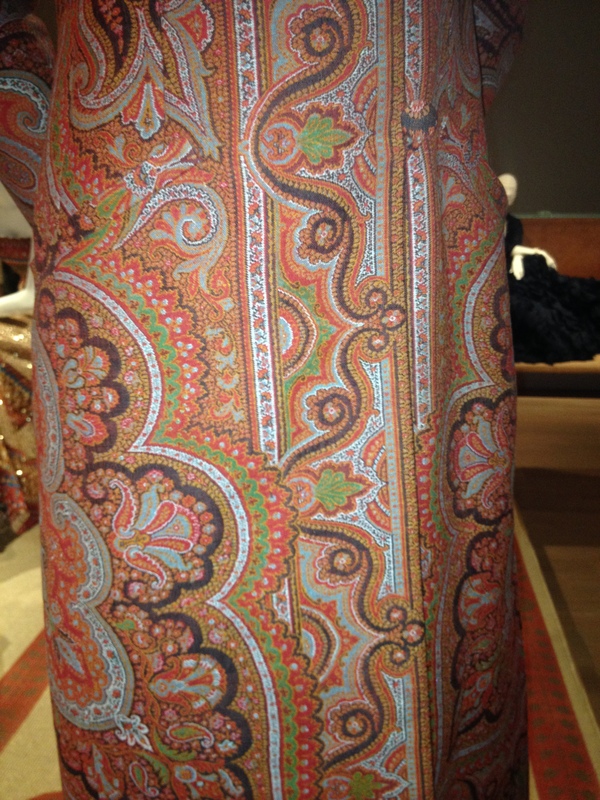 What a gorgeous skirt. 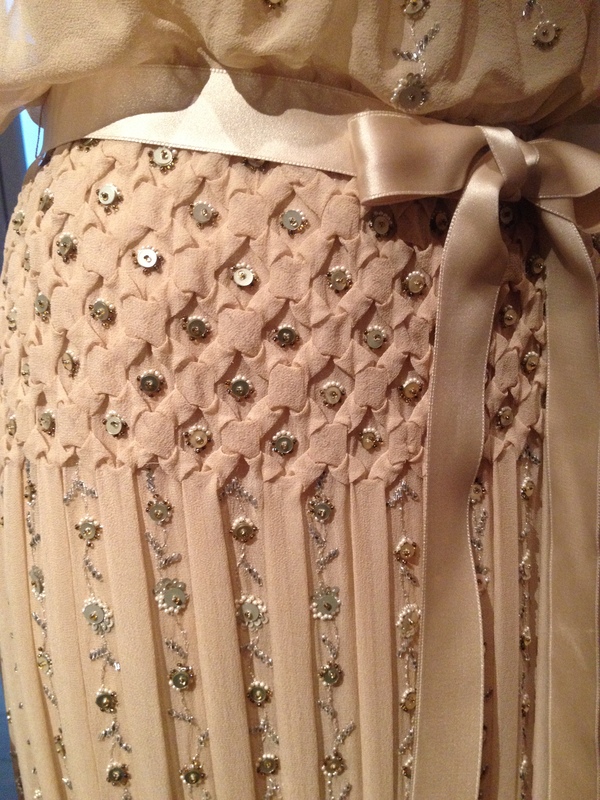 You had to look close to see the beaded embroidery. My flash went off when I snapped this photo, a no-no in any museum and I was reprimanded. Opps, sorry. 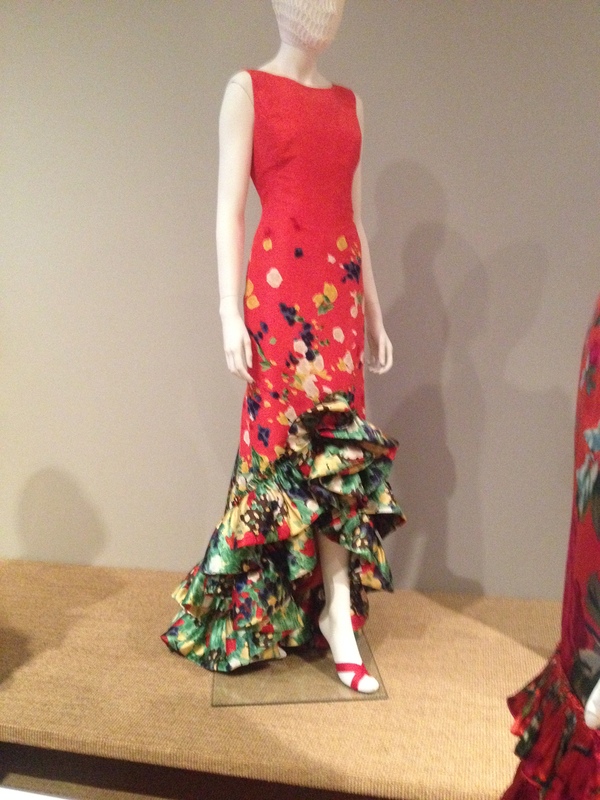 Another Vogue cover dress (seated) in silk, from March 2013 was worn by Beyonce. 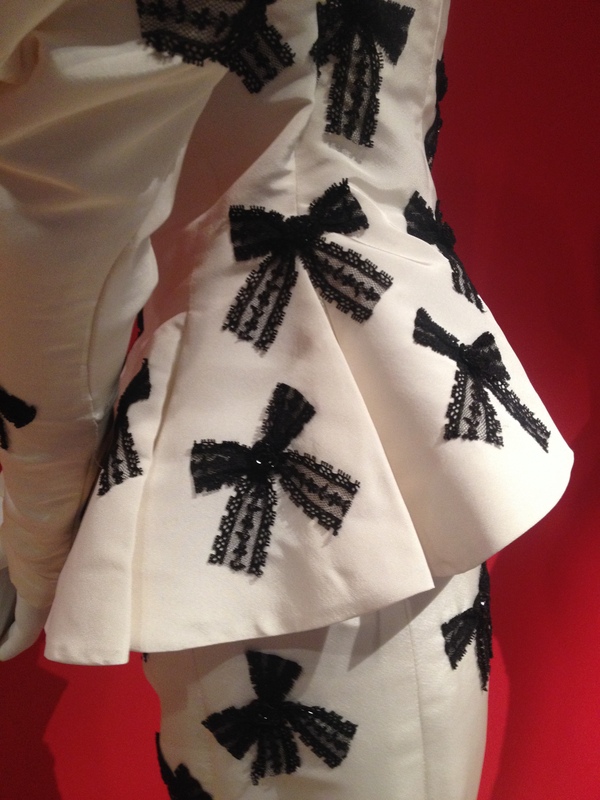 I really wanted to touch those ruffles, but manage to control myself after the flash incident. 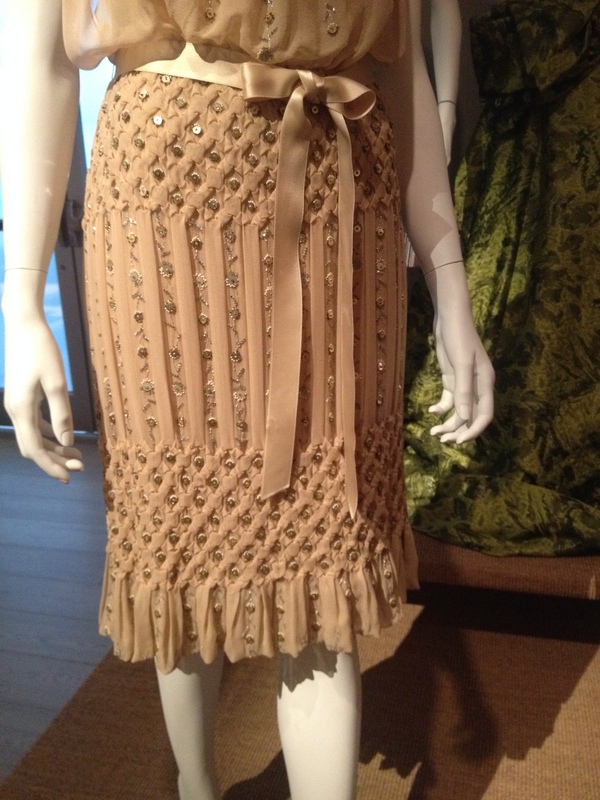 I initially thought Anna Wintour only loaned the silk flaminco skirt, then read the card about the cotton T-shirt. 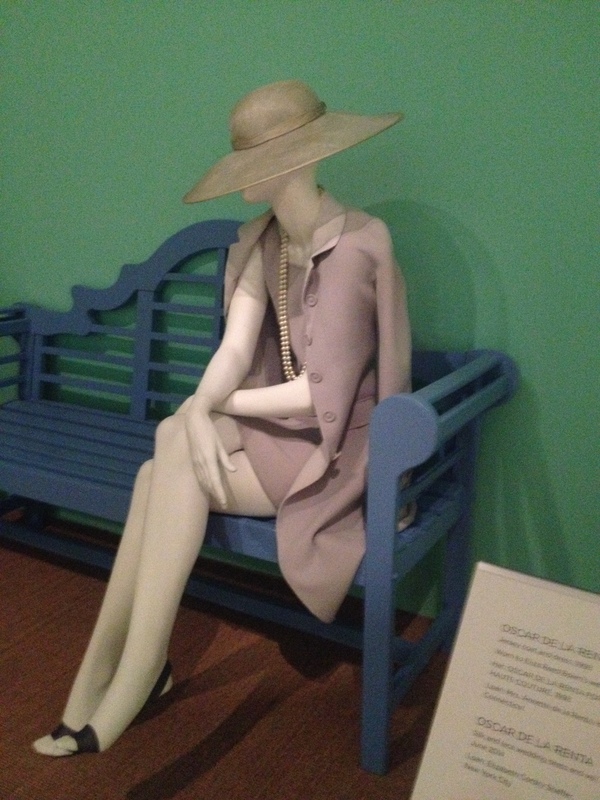 It was barely-there-thin and the same shade of white as the mannequin. 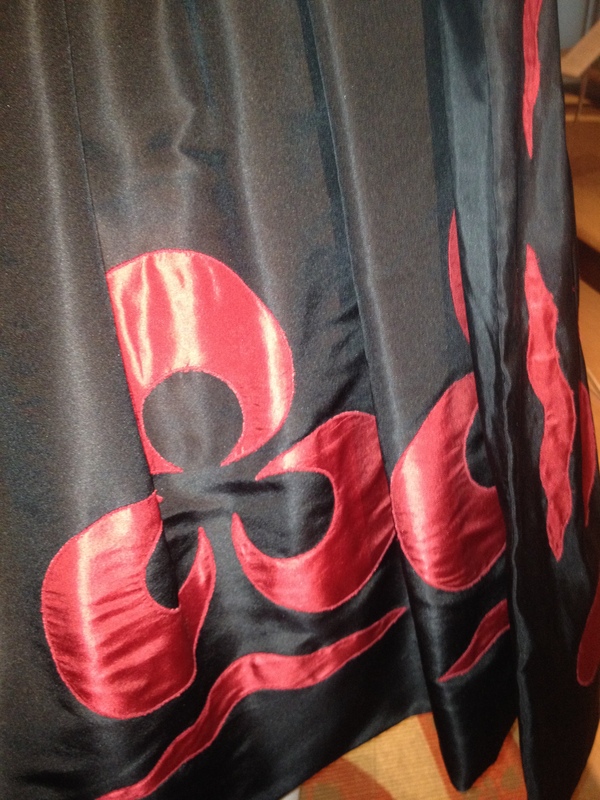 Can you picture Anna dancing in this? Sometimes it’s all about the back. Anna Wintour loaned the coat off her back. Can you see the welt pocket? 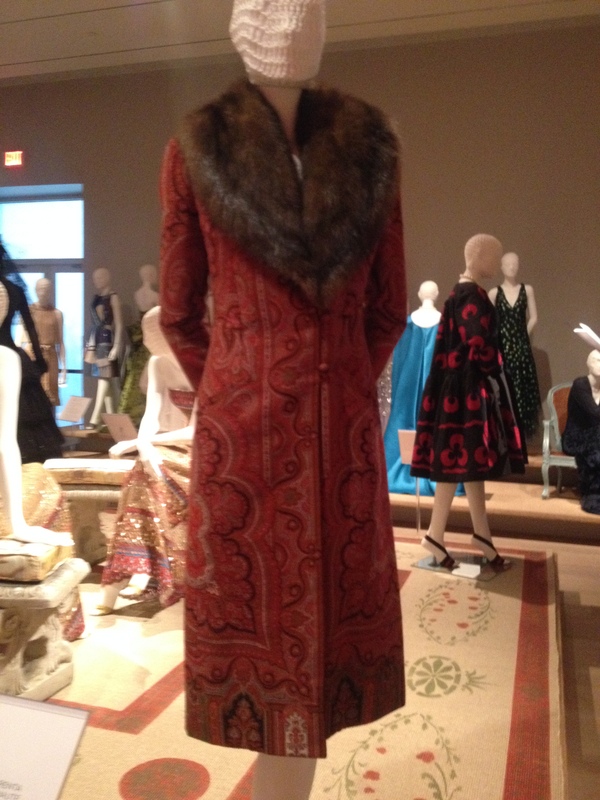 Then there was this silk coat and dress, fabulous. 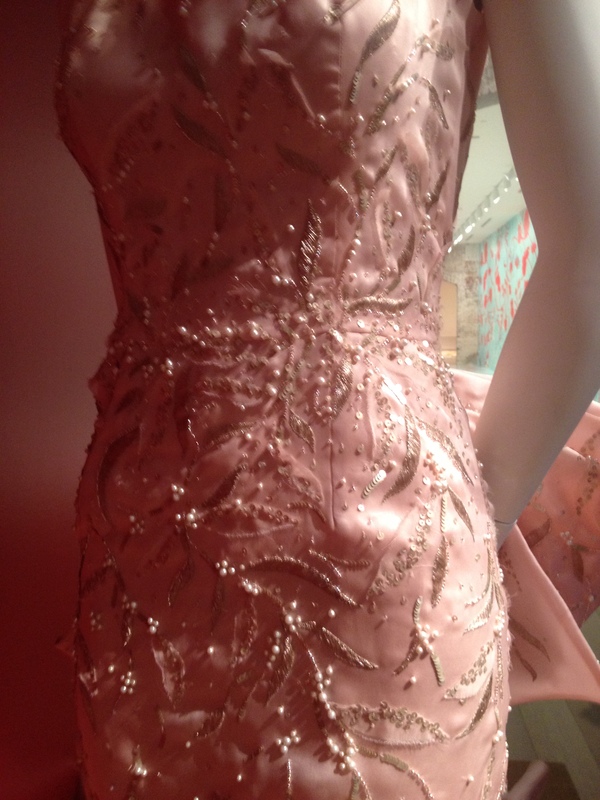 There were two of this embroidered sequin gown, one worn by Nicole Kidman to the SAG Awards in 2010. 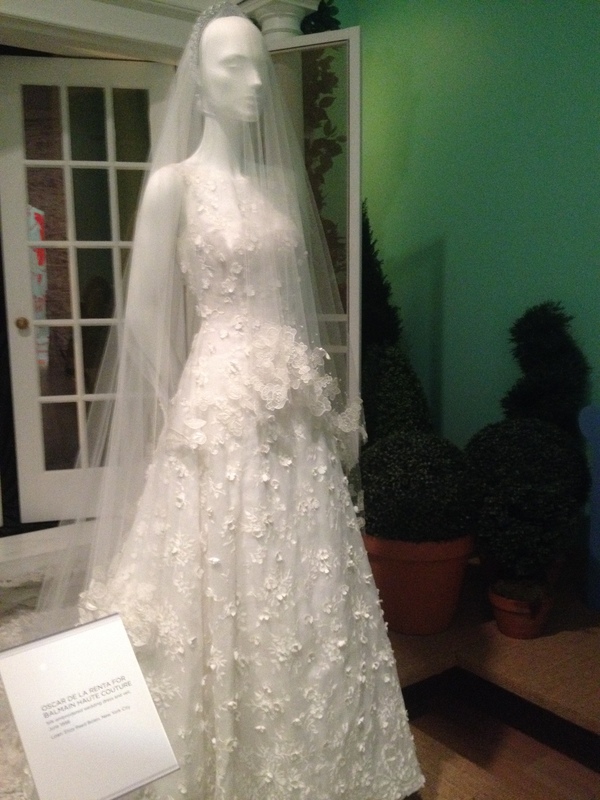 Two more dresses on loan from Mrs. de la Renta. 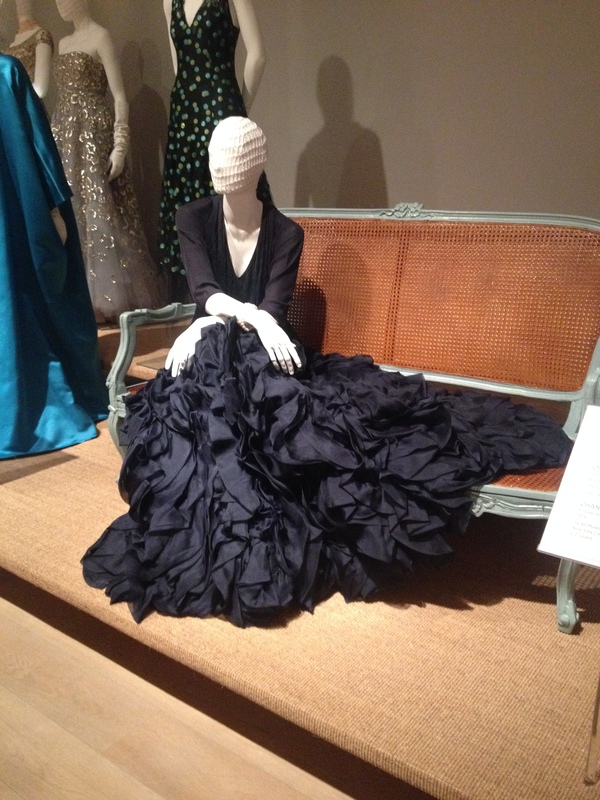 The black silk gown she wore to the Met Gala in 2008. 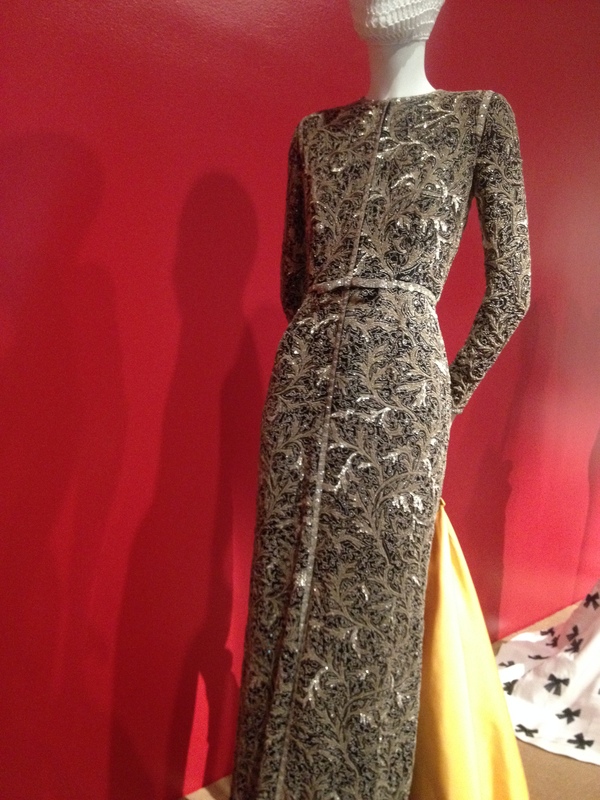 The jersey coat and dress she wore to a wedding in 1998. So timeless it could be worn today. 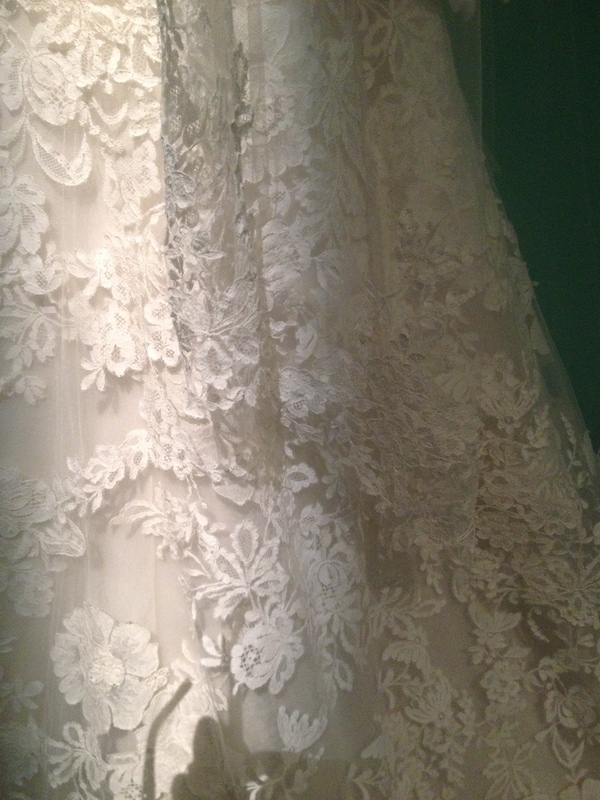 I love the cut of this wedding dress. 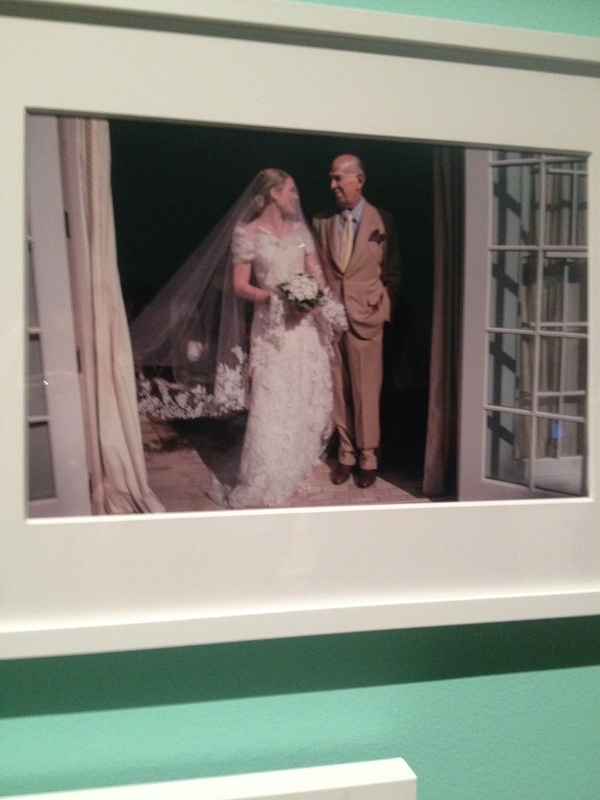 Imagine Oscar de la Renta designing your dress AND attending your wedding. It was an inspiring exhibit, with about 50 pieces. Next year a larger retrospective of his designs is planned for San Francisco’s de Young Museum. Hmmm, can I plan another trip? 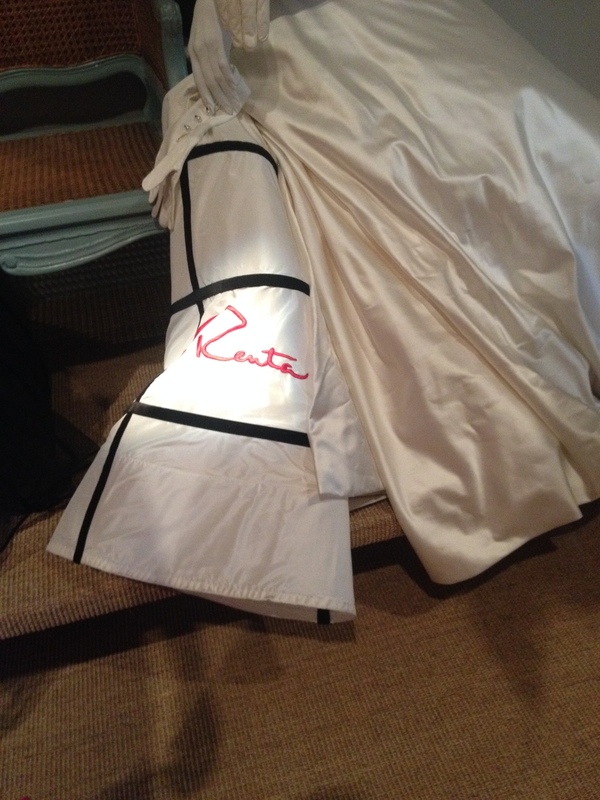 100 pieces of Oscar de la Renta with a side trip to Britex. After the our visit to the museum, we wandered the very walkable city, checking a few shops and lunching at this charming place. 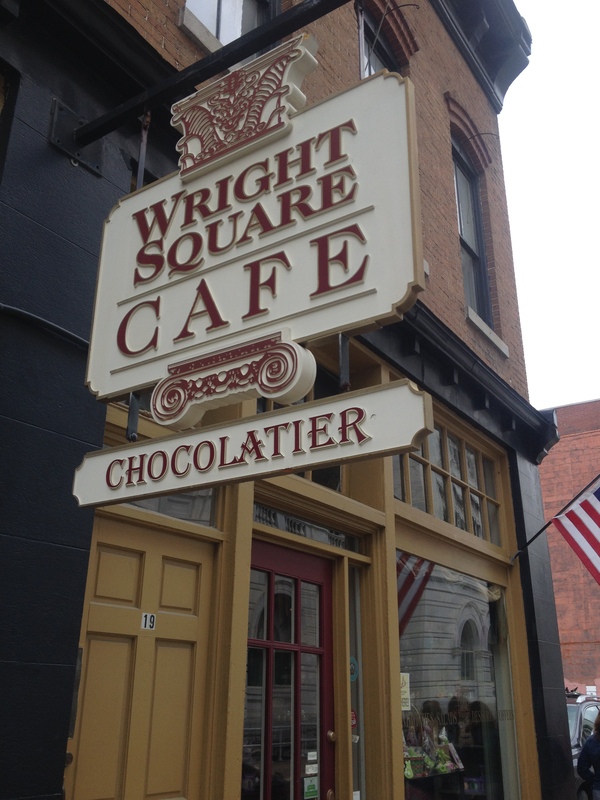 Had the best piece of chocolate, mmmmm, German Chocolate Cake truffle. What a day. What a wonderful survey of this exhibit! Thank you … I’ll meet you in San Francisco next year! Thanks, that would be fun. I’ll have to work on finding a way. Oh wow! What fabulous dresses. 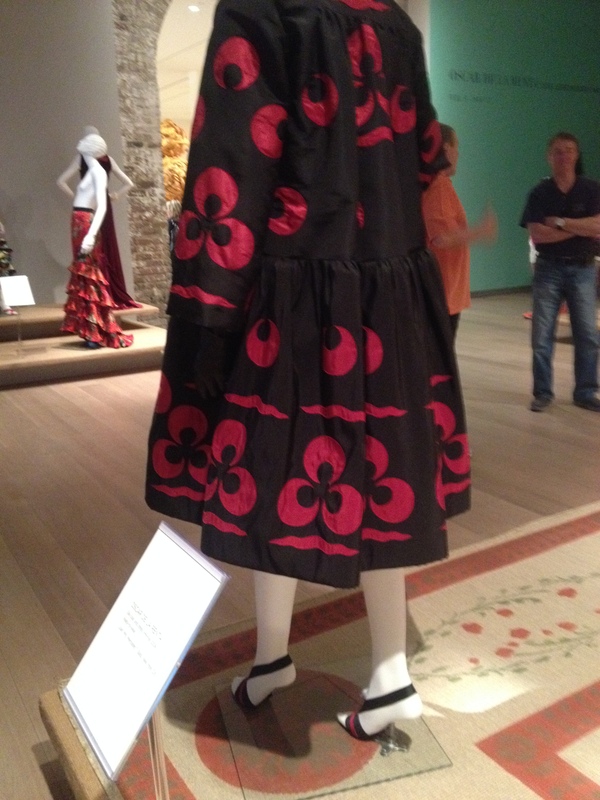 I too love the Taylor Swift one, but I loved the black dress and coat with red flowers! 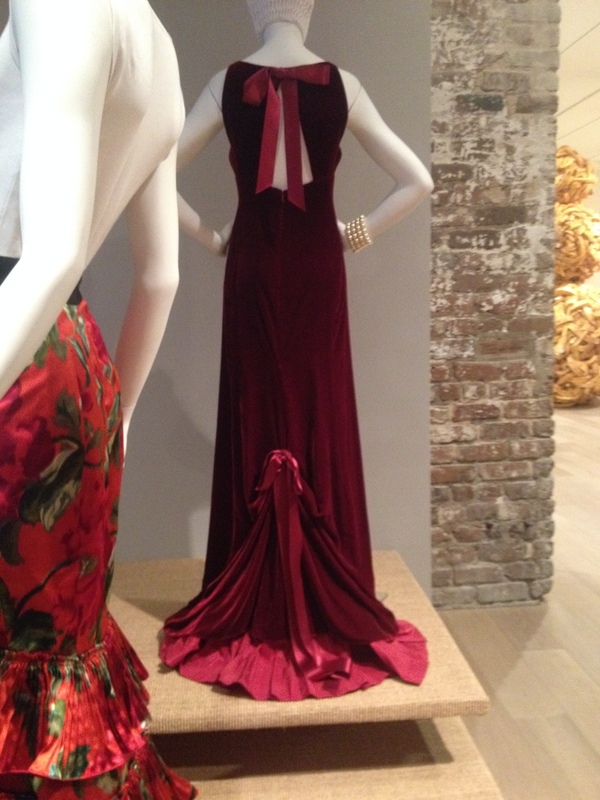 And the dress with the bow on the back, very inspiring. Which one are you going to copy?? I’ll be keeping the pink dress in mind when i start next year’s Auto Show Preview dress, but who knows what else I’ll find in the meantime. 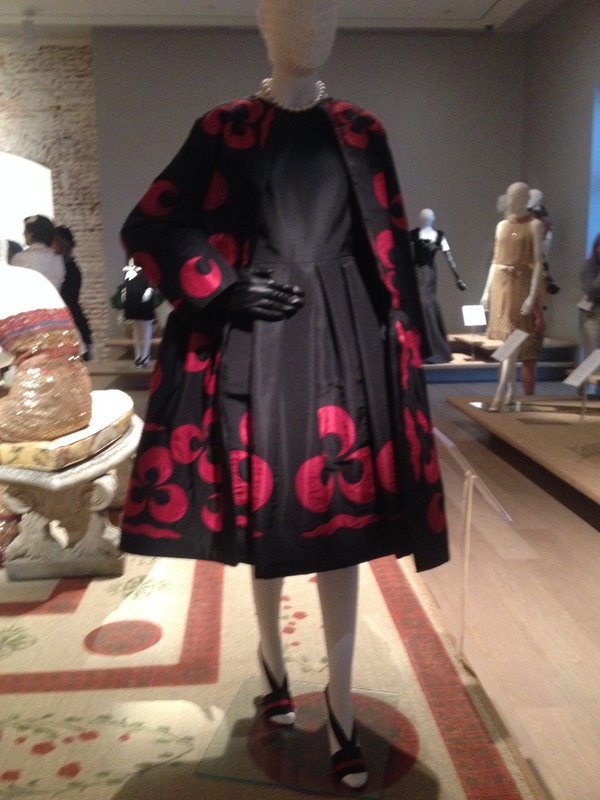 I loved the red and black coat and dress as well. I’ve been considering making a matching ensemble, so back to the fabulous fashion of the 50’s and earlier 60’s. Yes, me too! I have got a new pattern which has a coat and dress ensemble for a summer wedding I thought!?!? English summer is so unpredictable!! But I wondered about doing it in a lawn?? 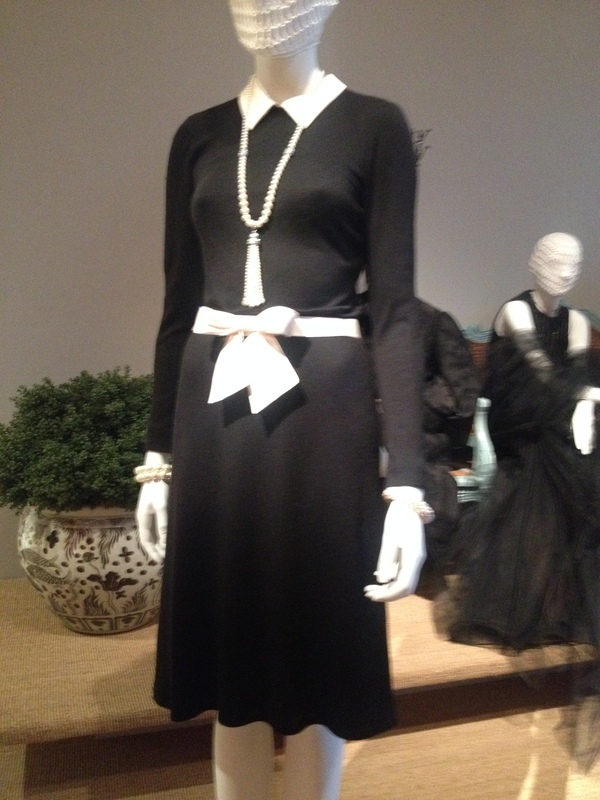 This is a look that needs to make a comeback, the ultimate in ladylike fashion. A nice lawn, with a pretty lining, fabulous. Are you thinking floral?